Bodleian Libraries and Cambridge University Library are entering into the last phase of the DPOC project, where they are starting to write up business cases for digital preservation. In preparation, the Fellows attended DPC’s “advocacy briefing day” in London. Policy and Planning Fellow, Edith, blogs about some of the highlights and lessons from the day. This week I had the pleasure of attending DPC’s advocacy training day. It was ran by Catherine Heaney, the founder of DHR Communications, and a veteran when it comes to advocating for supporting digital heritage. Before the event I thought I had a clear idea of what advocacy means in broad terms. You invite yourself into formal meetings and try to deliver measured facts and figures which will be compelling to the people in front of you – right? Well… not quite it turns out. Many of these assumptions were put on their head during this session. Here are my four favourite pieces of (sometimes surprising) advocacy advice from Catherine. The scenario which was described above is what communications professionals might call “the speech” – but it is only one little part of effective advocacy. 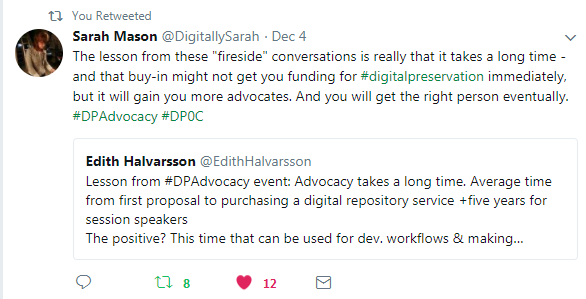 “The digital preservation speech” is important, but it is not necessarily where you will get the most buy-in for digital preservation. Research has shown that one-off communications like these are usually not effective. In fact, all of those informal connections and conversations you have with colleagues also come under advocacy and may reap greater benefits due to their frequency. And if one of these colleagues are themselves talented at influencing others, they can be invaluable in advocating for digital preservation when you are not there in person. Lesson learnt: you need to keep communicating the message whenever and wherever you can if you want it to seep in to peoples’ consciousness. Since digital preservation issues do not crop up that often in popular culture and the news, it is up to us to deliver, re-deliver… and then re-deliver the message if we want it to stick. When you know that you will be interacting with colleagues and senior management, it is important to do your background research and find out what argument will most appeal to the person you are meeting. Having a bog-standard ‘speech’ about digital preservation which you pull out at all occasions is not the most effective approach. In order to make your case, the problem you are attempting to solve should also reflect the goals and the challenges which the person you are trying to advocate to are facing. Financial costs and return on investment? About being seen as someone at the forefront of the digital preservation fields? Or perhaps about the opportunity to collaborate cross-institutionally? Tailoring your message to the audience is important, and this will be easier if you have material ready at hand which you can pick and choose from. Catherine suggested preparing a folder of stories, case studies, data and facts about digital preservation which you can cut and paste from to suit the occasion. The ranking is intentional. We tend to think that statistics and raw data will convince people, as this appeals to their logic. In fact, your argument will be stronger if your pitch starts with a narrative (a story) about WHY we need digital preservation and case studies to illustrate your point. Catherine advises that it is then when the audience is listening that you bring out the data and facts. This approach is both more memorable and more effective in capturing your audience’s attention. This connects to tip 2 – about knowing your audience. Catherine advised that, although it may feel strange at first, writing a personalised follow up message is a very effective tool. When you do have the chance to present your case to an important group within your organisation, the follow up message can further solidify that initial pitch (again – see tip 1 about repeated communication). By taking notes about the concerns or points that have been made during a meeting, you have the opportunity to write personalised messages which captures and refers back to the concerns raised by that particular person. The personalised message also has the additional benefit of opening up a channel for future communication. This was just a small subsection of all the interesting things we talked about on the advocacy briefing day. For some more information have a look at the hashtag for the day #DPAdvocacy. This entry was posted in advocacy, business case, digital preservation by ehalvarsson. Bookmark the permalink.